While you were sleeping… about an hour before sunrise the western horizon begins to glow a deep orange. Overhead, the stars still shine enough to make out Orion and other constellations. 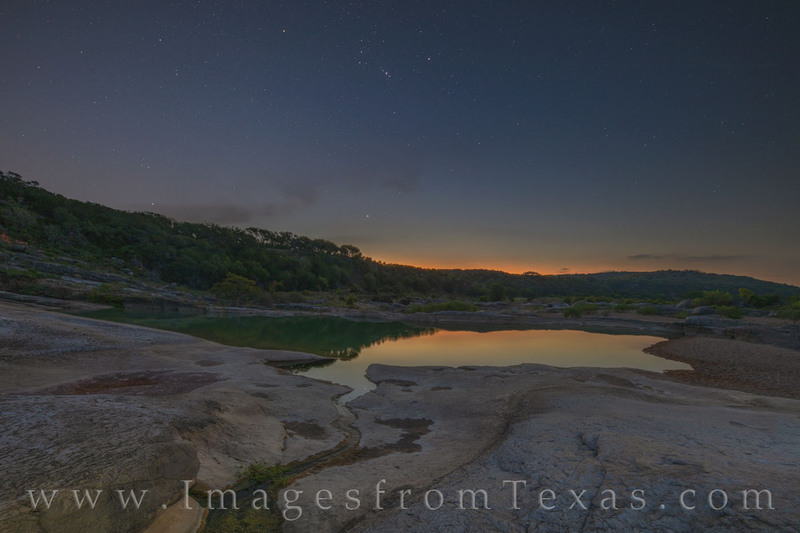 Under the stars, a trickle of water flows down the limestone rocks into a still pool along the Pedernales River. Nights like this are special, and the quiet brings a peace to my soul. For specifics on this image… the stars were taken with a star tracker so they would appear tack-sharp even when enlarged. The foreground was taken with a few minutes later for a crisp landscape. The two were blended together in photoshop to create the scene our eyes see but the camera cannot capture in one single photograph. Photo © copyright by Rob Greebon.